O Lord ! you are the wise, the pure, the pious and the ancient above al others in austerity. O Lord ! you destroyed evils and discarded anger, you are the omniscient. O Lord ! you conquered Mara, you are the blissful and you condemned the unholy and false ways. O Lord ! your fwwt are marked with the thousand spoked wheels. I do not have thousand tongues ! How shall I praise thee. In so much as we have translated that message in our own life, are we fit to pay our homage to that Great Lord, Master and Teacher of mankind, so long as the world lasts, I have no shadow of doubt that He will rank among the Greatest of teachers of mandkind. On this full moon day of Vaisakh, I have come to join in the Birthday celebration of the Lord Buddha and to bow my head reverence to Him whom I regard in my inmost being as the Great Man ever born on this earth…in far distant lands men proclaimed the epiphany, they announced that they have seen the Supreme Men shining like the sun that had rent the veil of darkness. The brightest, the greatest and the wisest Son of India, in this world of strife, hatred and violence, the message of the Buddha shines like a radiant sun. If there is any name which is known outside India, which is popular and revered, it is not the name of Rama or Krishna, but the name of the Buddha. There never was occation when the Buddha flamed forth in anger, never an accident when an unkind word escaped His Lips. Dr. S.Radhakrishnan., the Former President of India. I cannot myself feel that either in the matter of wisdom or in the matter of virtue Christ stands quiet as high as some other people known to history – I think I should put Buddha above him in those respects. Infinite is wisdom of the Buddha, borderless is the love of Buddha to all that lives. Buddha as called the Mahakarunika which means the all Merciful Lord who has compassion on all that live. To human mind Buddha’s wisdom and mercy is incomprehensible. He was a human being with no connection whatever with God or any other Supernatural Being. He was neither a God nor incarnation of God nor any mythological figure. He was a man but a Superman, an Extraordinary Man (acchariya-manussa). He was beyond the human state inwardly though living the life of human being outwardly. He is for this reason called a Unique Being, Man Par exellent (purisuttama), a Buddha, an Enlightened One. Lord Buddha can be very easily singled out as one person known to man received homage from the greatest number of mankind. If yoy desire to see the most noble of mankind, look at the king in beggar’s clothing; it is He whose sanctity is great among men. Abdul Atahiya, a Muslim Poet. The Buddha is not a property of Buddhists only. He is the property of whole mankind.His teaching is common to every body. Every religion which comes to exist after the Buddha has borrowed many good ideas from the Buddha. The Buddha is like a physician. Just as a doctor must know the diagnosis of the different kinds of illness, their causes, the antidotes and remedies , and must be able be apply them, so also the Buddha has taught the Four Holy Truths which indicate the range of suffering, its origin, its cessation and the way which lead to its cessation. ฺฺBuddha is one who sees his children playing in the consuming fire of worldliness and employs different expedients to bring them out of this burning house and lead them to the safe asylum of Nirvana. I feel more and more that Sakyamuni is the nearest in character and effect to Him who is the Way, the Truth and the Life. The most striking thing about the Buddha is almost a unique combination of a cool scientific head and profound sympathy of a warm and loving heart. The world today turns more and more towards the Buddha, for He alone represents the conscience of humanity. Buddhism stands unique in the history of human thought in denying the existence of such a Soul, Self, or Atman. According to the teaching of the Buddha, the idea of self is an imaginary, false belief which has no corresponding reality, and it produces harmful thoughts or “me” and “mine”, selfish desire,craving, attachment, hatred, ill-will, conceit, pride, egotism, and other defilements, impurities, and problems. It is the source of all troubles in the world from personal cinflicts to wars between nations. In short this false view can be traced all the evils in the world. It is perhaps significant that while mighty empires built upon greed and oppression have never lasted for more than a few centuries, the selfless life of the Budhist community has carried it safely through 2,500 years…Knowledge of Buddhism is being sought with increasing interest in the West, for it offers a personal philosophy to counteract the fragmented condition of Western society where many individuals no longer feel part of or responsible for , the community in which they live. Expressions of this distress are seen in the demonstrations of students, flower people, hippies and others who wish to drop out of, or change a society which they feel no longer supplies their needs. All the teachings of the Buddha can be summed up in one word “Dhamma”. This law of righeous ness exists not only in a man’s heart but it exists in the universe also. All the universe is an embodiment or revelation of Dhamma. The laws of nature which modern science have discovered, are revelations of Dhamma. If the moon rises and sets, it is because of Dhamma, for Dhamma is that law residing in the universe that makes matter act in the ways studied in physics, chemistry, zoology, botany and astronomy. 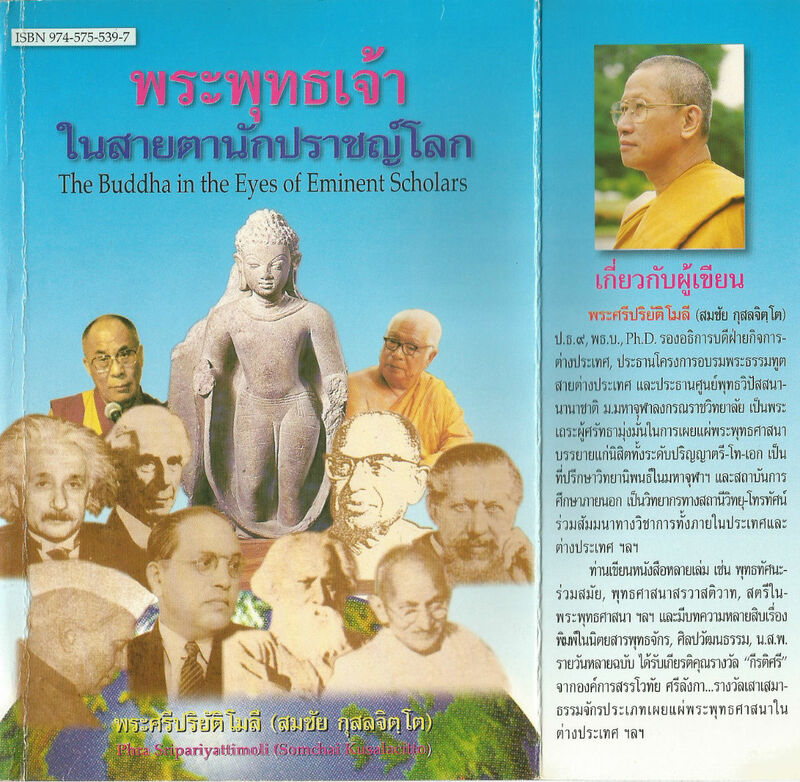 Dhamma exists in the universe just as Dhamma exists in the heart of man. If man will live by Dhamma, he will escape misery and attain Nibbana. The religion of the future will be a cosmic religion. It should transcend a personal God and avoid dogmas and theology. Covering both the natural and the spiritual, it should be based on a religious sense arising from the experience of all things, natural and spiritual, as a meaningful unity. Buddhism answers this description…..If there is any religion that would cope with medern scientific needs, it would be Buddhism. Today Buddhism and Buddhist art have spread around the world, from Japan east to America, from India west to Europe. Many of these European students of Buddhism became converts to new faith. They were also active in the creation and guidance of Buddhist organizations-matters in which the Asiatic Buddhists are less incline to engage. Buddhist or not Buddhist, I examined every one of the great religious systems of the world, and in none of them have I found any thing to surpass, in beauty and comprehensiveness, the Noble Eightfold Path and the Four Noble Truths of the Buddha. I am content to shape my life acording to that path. the Founder-President of the Pali Text Society. Buddhism is a combination of both spectulative and scientific philosophy, it advocates the scientific method and pursues that of a finality that may be called rationalistic… It takes up where science cannot lead because of the limitations of the latter’s instruments. It’s conquests are those of mind… There is no reason to suppose that the world had beginning at all. The idea that things must have a beginning is due to the poverty of our imagination. As a student of comparative religion, I believe that Buddhism is the most perfect one the world has ever seen. The philosophy of the Buddha, the theory of evolution and the law of Kamma were far superior to any other creed. If I am to take the results of my philosophy as the standard of truth I should be obliged to concede to Buddhism the pre-eminence over the rest. Alone of all the great world religions Buddhism made its way without persecution, censorship or inquisition. In this world of storm and strife, hatred and violence, the message of the Buddha shines like a radiant sun. Perhaps at no time was that message more needed than in the world of the atomic and hydrogen bombs. Two thousand five hundred years have only added to the vitality and truth of the message. Let us remember that immortal message and try to fashion our thoughts and actions in the light of that teaching. We may face with equanimity even the terrors of the atomic bomb age and help a little in promoting right thinking and right action. Although one may originally be attracted by its remoteness, one can appreciate the real value of Buddhism only when one judges it by the result it produces in one’s own,life from day to day. I know nothing more grand in the world than the figure of the Buddha. This grandest creation of art, the figure of the Buddha, surely could not have been produced by a pessimistic religion. Here it is necessary to draw attention to another unique feature of the religion of the Buddha, namely that it is the only religion of any religious teacher, which is the outcome of a consistent philosophy, which claims to tell us about the ultimate facts of existence and reality. The religion of the Buddha is a way of life resulting from the acceptance of a view of life, which is said to be factual. His philosophy is not without an account of the nature of knowledge. Without sensuous pleasure would life be endurable? Without belief in immortality can man be moral? Without worship of a God can man advance towards righteousness ? Yes, replies the Buddha, these ends can be attained by knowledge; knowledge alone is the key to the higher path, the one worth pursuing in life; knowledge is that which brings calmness and peace to life, which renders man indifferent to the storms of the phenomenal world. 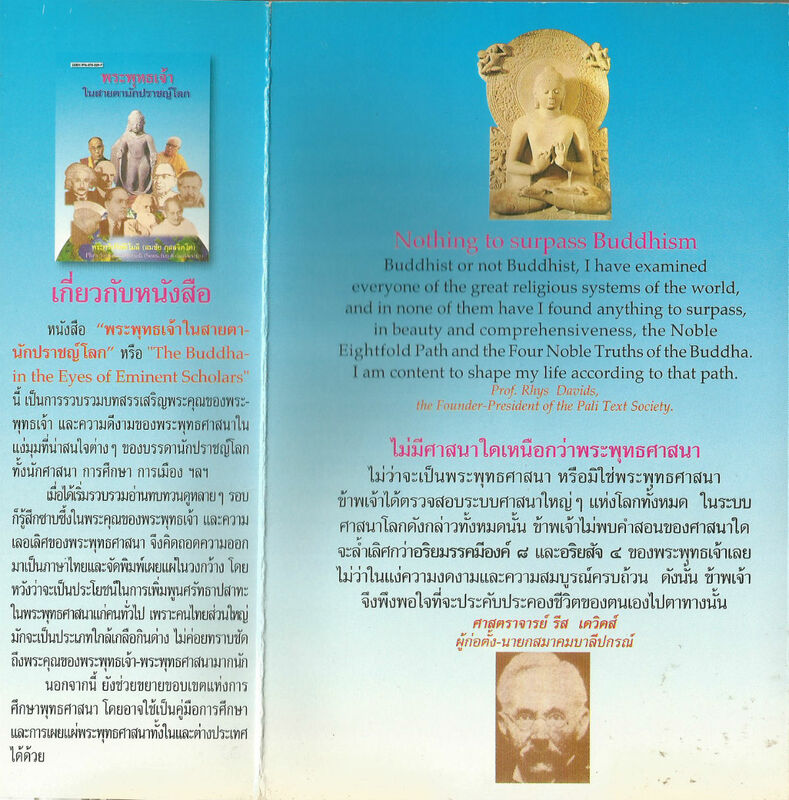 ฺBuddhism is, on the contrary, a system of thought, a religion, a spiritual science and a way of life, which is reasonable, practical and all-embracing. For 2500 years it has satisfied the spiritual needs of nearly one-third of mankind. It appeals to the West, insists on self-reliance coupled with tolerance for the other’s point of view, embraces science, religion, philosophy, psychology, ethics and art, and points to man alone as the creator of his present life and sole designer of his destiny. Surely the mysterious East, that fertile mother of religions, has given us in Buddhism a true revelation, since it makes known to us the moral beauty and purity that lies in the deep of human nature needing no other divinity than that which abides in the human heart to awake them into living glory. Everyone wants to be happy and never wants to suffer. But why are people still suffering and unable to do away with their own sufferings themselves ? Sometimes, the more they try to get rid of them, the more they suffer. This is because they do not know what is the true cause of suffering, what is the true cause of happiness. If they knew,they would be successful. They would eliminate the cause of suffering and create the cause of happiness. One of the important of obstacless to this success is one’s own mind. Because we comply too much with the dictates of our minds, we have to suffer.